What a bizarre night Wednesday was! My only realistic hope going into the game was that we didn’t get thrashed. 15 minutes in, and it looked like we would be but, credit to Redknapp and the players, they put in a decent shift in the second half, and pulled it back to a respectable score. Of course, they owed much of that to Gareth Bale, who put in a phenomenal second half showing. The sad thing about the game was that we didn’t give ourselves a chance. Before we could get to grips with the quality of the team that we were up against, we were 1-0 down. Before I go into my interpretation of what went wrong for the goals, it may be useful to show the formations that the two sides were playing, if only to appreciate the fluidity of the Inter team. Image taken from The Telegraph. At half-time on ITV, Gareth Southgate singled out Jenas as being almost solely responsible for this goal. Many will disagree, but for me Jenas should take less than 50% of the blame..
Zanetti picks the ball up in midfield, and Jenas gets close to him. Notice Coutinho’s position on their left at this point, and likewise Hutton’s starting position. Lennon has an eye on Chivu. Zanetti finds Coutinho, and Hutton goes out to meet him. Zanetti has also tempted Jenas into thinking he can get at the ball, meaning that his momentum has carried him beyond Zanetti. Zanetti is already looking to exploit this. Lennon has a great view of what’s unfolding from his position, and Bassong is tight to Eto’o. NB: Come back to this image once you have seen the first image from the fourth goal. Hutton follows Coutinho as if he’s a man-marker, leaving a gaping hole on our right-hand side. 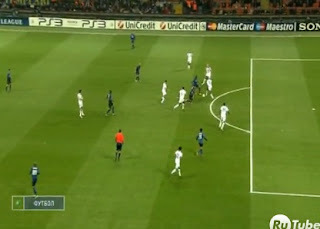 In my opinion, Hutton should be passing Zanetti on to Huddlestone at this point, and, holding his position (i.e. handing over responsibility, and retreating). Jenas and Lennon between them can still do something to plug the gap on the right from here. Also notice Eto’o; he has done nothing clever – he has simply run off Bassong, who is ball-watching, and is now in acres of space between our midfield and defence. Coutinho’s pass finds Eto’o, who is in acres of space due to Bassong switching off, and is in turn is looking to feed the ball into our right-back area. Jenas has been caught in two minds – tracking Zanetti or keeping an eye on Snjeider, who is also lurking. This is what Gareth Southgate hammered him for, but for me the issue wouldn’t have been there had Hutton passed Coutinho on. Even so, Jenas must take some responsibility for not tracking him – as must Lennon. I have a sneaky suspicion that Eto’o was actually looking to play Coutinho in, but I could be selling him short. 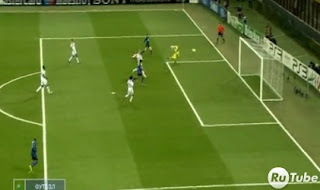 It works out as a perfectly weighted pass for Zanetti, who just has Gomes to beat from a difficult angle. Some will say I’m harsh, but Gomes for me doesn’t do enough. He’s come out to close off the angle (rightly), but for me he doesn’t make himself big enough. He’s ridiculously close to the ball, but doesn’t extend his arm, and it curls beyond him, pretty much into the centre of the goal. So for me, the majority of the blame has to go to Hutton, who shows a real lack of positional discipline, but it was collectively bad defending, with mistakes from Jenas, Bassong, Gomes and arguably Lennon. Four minutes later, and it’s effectively game over. 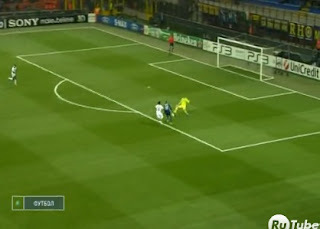 Sneijder has the ball in the middle of the pitch. Our defence has got itself into a real mess. Bassong has stepped up, whilst Gallas and Assou-Ekotto have dropped off. Assou-Ekotto is far too wide – he should be a lot closer to Bassong, so that Sneijder doesn’t have the opportunity to play the ball inside him. The pass is beautifully executed, and Biabany is through, having caught Assou-Ekotto napping. Gomes is late out – he has made the decision to come, but having done so, he has to get something on the ball. Rather than going hands first towards the ball, he goes with his feet. All he does is absolutely clatter Biabany, and the referee has no alternative but to award a penalty, and send Gomes off. A really bad decision from Gomes, who is normally so reliable. Eto’o strikes the ball into the top of the net – Cudicini guesses right, but still can’t get close enough. From bad to worse! Just three minutes after the penalty, and they kill us off. Totally shell-shocked, we seem to be enjoying watching Inter pop the ball around, and don’t get close enough to make a challenge. 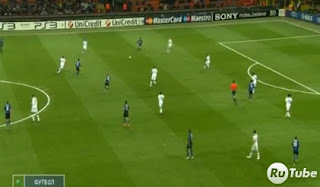 They make over 20 passes, and Maicon has got himself forward, faced up by Bale. Maicon threads a ball with the outside of his right to Stankovic. He has cleverly got himself between Jenas and Huddlestone, and is well aware of Eto’o’s position – Gallas is quite tight to him. You really need to watch the video to appreciate what happens next – Stankovic plays a first time one-two with Eto’o – the pass is so nicely cushioned back to Stankovic. Huddlestone, though, has tracked Stankovic, and is in a position to affect the game – if he can just put his foot through the ball, the chance is gone. Unfortunately, it travels through his legs – he is a bit clumsy and awkward, and can’t sort his feet out. Stankovic finds himself with the space to take an early shot from the edge of the box, with both of our centre backs hopelessly standing off. It’s relatively well placed, but Cudicini presumably wasn’t expecting it – he barely moves. Surely worth a dive, Carlo?! I can only think that he was wrong-footed. Eto’o’s second goal is yet another where one of our players has been caught out by some clever movement; this time Gallas. Coutinho has the ball, and cuts in from the left again – this time tracked by Lennon, with Hutton holding position on the right (so they did learn one lesson from the first goal!). Is Gallas being tempted by the ball, or trying to play offside? Either way, he’s not goal-side – Eto’o is on his shoulder. When the ball is played, Eto’o is comfortably onside, and Gallas has no chance of getting back at him. Gallas has often relied on his pace as a defender, but Eto’o is so fast – you just can’t defend like this against him, you have to be goal-side, or 100% sure that you can play off-side. He is an experienced player, and should know better. Once in, Eto’o doesn’t have a great deal of the goal to aim at, and Cudicini actually does quite well to narrow the angle. I would have expected Eto’o to either curl this into the far post, or lift it over Cudicini, but he actually goes for the near post. 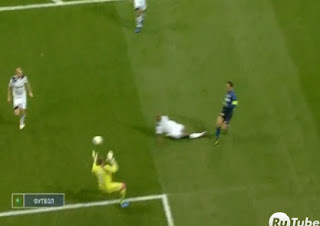 Cudicini should be seeing this one out for a corner – it’s not a difficult save to make, and it pretty much goes right through him into the near corner. Whilst we defended really poorly in the first half – both collectively and individually – we learned our lessons in the second, and stopped it from becoming a rout. Credit to the players for that, but they really let themselves down in the first half. We have not been helped by having our three best centre halves out injured, and by the amount of defensive changes that we are having to make, but this was the same back five that had played against Fulham, and so there was some continuity. Obviously Inter are a brilliant team, and it’s no wonder our players were a bit stand-offish, but some of the mistakes were so basic. Great blog as always. You must have the constitution of an ox to do this! I watched a replay of the second half, but skipped the first 45 to be honest. Shame Lennon didn't get at Chivu more after his yellow card, might have evened things up a bit. Is anyone in the Spurs midfield or defence clear of blame for something? What a catalogue of errors and all in the first 15 mins. The first goal is crucial. Did we give them too much respect or not enough? What were we thinking about? Were we thinking at all? That said I ended up in a state of euphoria, well for several minutes anyway. You aught to be available free on the National Health Windy. Leading to penalty. Bassong was over to the right, trying to mark Gallas's opponent! 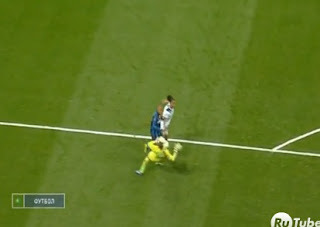 If he had been in position, the ball into the area would not have been possible.